This lesson focuses on Chesed (kindness) and combines it with the topic of Lashon Hara (use kind words/avoid hurtful speech). Kindness and kind words go hand in hand. Often times, our students are unaware of the power their words hold. Throughout this lesson, we will explore the meaning of kindness and examples from the Torah, as well as ways that we can encourage kindness. We will learn that the things that we say leave lasting impressions on people, and discover new ways to express ourselves. Furthermore, the reading and discussion of two exceptional stories, Those Shoes by Maribeth Boelts and One by Kathryn Otoshi, further enhance the conversation, and bring to life the tremendous impact that one person can make in the life of another...how one person s kindness can lift a heart. Note: It is recommended that this lesson be done at the beginning of the school year- although it is always appropriate to teach about kindness. While created for grades 1-2, the lesson can be adapted for all grades using different book selections and additional resources. For example, with fourth graders and older, encourage students to create their own kindness cards (or purchase Acts of Kindness (AOK) Cards or print free Spread Kindness Cards). The students will gain a deeper understanding of the term “kindness” and what it means. The students will connect kindness throughout their daily lives to kindness themes found in the Torah. The students will learn the power of one, and how one person can make a difference. The students will be able to identify harmful words and replace them with kinder alternatives. The students will draw on prior knowledge and experiences to create discussion points and write together. Acts of Kindness (Chesed)- Throughout the Torah, we see themes of kindness. It is said that Hashem’s creation of the world was an act of kindness, as He created the world in order to bestow His kindness upon us. When we say Modeh Ani in the morning, we are thanking Hashem for his ultimate gift of kindness, the gift of life. Lashon Hara- Negative talk has been cited as the reason for many tragedies throughout Jewish history. The snake spoke ill of Hashem while convincing Eve to eat the apple, Joseph’s brothers spoke ill of him to their father, and Jews speaking ill of other Jews was the reason for the destruction of the second Beis Hamikdosh. While the theme of Lashon Hara may be more of an adult theme, it is never too early to teach children about the value of their words. We learn to speak kindly of others, and not to repeat things that we may have heard of others. We can teach that although words may not physically hurt, they can often do more damage than we can see. Please note: The lesson can be completed over the course of a few days, a week or even longer-depending upon teacher time-frame and student interest and understanding. The teacher will begin the lesson by showing the class several photos of children looking sad. Teacher will facilitate classroom discussion by asking questions: What do you see in the picture? Why do you think he looks sad? Have you ever felt sad? What made you feel sad? What do you do when you feel sad? Have you ever made someone feel sad? Allow discussion to happen naturally and listen to the students. Introduce students to the idea of kind words, and the fact that words can be hurtful. Discuss alternative (kinder) ways to say something. If someone needs to borrow a pencil, wouldn’t you rather hear "Do you have a pencil I can use?" instead of "Gimmie a pencil!"? Key words should be identified and written on the board. Read the book One for enjoyment. Let the students know that you will be reading it more than once. The second time you read it, allow the students to interject with things that they notice (for example, when Red gets big, Blue gets smaller. Has anyone ever felt like that?). Discuss how all it took for Red to stop being a bully, was for One to stand up. Was there ever a time when One stood up for them, or when they were the One? How did Blue feel when Red said mean things to him? How do your students feel when mean things are said to them, or when they say mean things? Repeat the same process with Those Shoes. Find out about a time when your students really wanted something. What was it? Did they get it? How did they feel when they finally got it? Have they ever noticed someone who had less than they did? Many students may mention that they have seen homeless people or that mommy or daddy have given money to someone on the road. This is an excellent opportunity to discuss how little some people have and how there are many ways to give help that isn’t just monetary. Please don’t shy away from this sometimes difficult topic! Our students see things and are more aware than we may think! After reading Those Shoes, discuss how Jeremy feels after giving Antonio the shoes that were too small for him. Now is a teachable moment! By doing something kind for others, we benefit as well! Gauge your class discussions for an appropriate time to show one or more of the videos listed in the Explore, Discover and More Section (below). Now that stories have been read, and discussions have taken place, we are ready to begin the writing portion of the lesson. Students will be creating two separate pieces. One piece of writing will be displayed on an educational bulletin board. The second piece of writing will be compiled into a class book on kindness. Again, these answers should be genuine and unprompted. As you begin to call on students, write their answers on the chart paper/board. For this part of the activity, write things exactly as the student says. 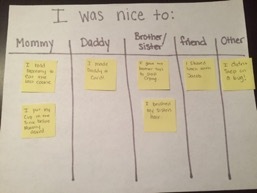 Almost all students should be able to think of a time when they were nice to someone else. If some examples are needed, something like “helping mommy feed your baby brother”, or “cleaning up your toys when daddy asks” are appropriate examples. Do you notice a theme with their answers? Does it seem like most students are nice to their parents? Or classmates? As a class, we will organize our thoughts into categories, based on who our students are kind to. Using post-it notes on the board, clearly arrange the number of students corresponding with the categories. The goal of this part of the lesson is simply to point out that while we want to be kind to our parents and our classmates, we can also be kind to teachers and maintenance workers at the school, the elderly and the young, the sick and the healthy. There are no limits to who we share our kindness with. To begin the writing process, students should be given blank paper, or paper with writing lines at the bottom. Students will be drawing a moment when they were kind, or when someone was kind to them. It can be the same example that they gave during the earlier discussion, or it can be one that came to them just now. Encourage students to use detail and color! As the students begin to finish their drawings, call them over and ask them to explain what is happening in the picture. Every detail is important! We want for the students to be able to not only create a picture, but also to label specific parts of the drawing, and write a minimum of one sentence that details what is happening in the scene they have drawn. To publish the work, display on bulletin board either in the classroom or in the hallway. If a student would like to share their work, allow them to do so! Each individual work will ultimately come together as a class publication. Building on what was discussed as a class, this writing will not be about ways that we have helped or been helped, but ways that we can help, be considerate, and spread kindness. The writing will not be limited by experiences, but encourages the students to think and to discuss. Now we are creating a dialogue that opens the future to limitless moments of chesed where our students are the ones to begin healing the world. Again, class discussion is encouraged, even just amongst students. The spoken word will lead to the written word! Students should be able to come up with several ideas. These do not have to be full sentences, but can be. “Throw away garbage” is just as fantastic as “I can throw away garbage when I see it”! Once each student has written 2-3 ideas on their paper, it’s time to discuss again! You may hear some creative ways to help make the world a kinder place, and that’s beautiful! We do not want to tell a student that their idea is silly, or won’t work, or isn’t actually a kind thing to do. Allow the child to explain, and if necessary, help them find the words to fully and clearly explain their idea. Using a highlighter, the teacher will write down as many of the wonderful kindness ideas as they have, each one on a single page. These highlighted pages will be handed back to the students. Students will then use pencil to trace over the highlighted words. Using the highlighted piece as modeled work, the students will be able to complete a page of their writing in their own handwriting, while reinforcing proper spelling and conventions. 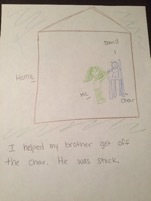 Allow the students to draw and color a picture that goes along with their writing. When the class has completed their pages, make color copies of their work. The highlighted writing will not appear, leaving only the child’s handwriting and thoughts behind. Organize the writings into a book format, and create a cover. A class copy can be made, or copies can be made for each student. It is a beautiful way for students to get ideas on kindness whenever they would like! When the lesson is nearing completion, take students outside. In a lesson similar to letting feathers loose, we will be teaching the students that we cannot get words back after we have said them. Since bubbles are more eco-friendly, that is what we will be using. While blowing bubbles, allow students to yell out words. They do not have to be relevant to the activity, but they should be appropriate for school. Suggestions are things that they have said to others or that others have said to them, be it negative or positive. The idea is that each word attaches itself to a bubble. After several minutes of bubbles, bubble popping, and laughter, stop blowing the bubbles. Allow the students a moment to realize that the bubbles have all popped. Ask the students to please bring back all of the bubbles. What happened to their words? Are they are able to get them back? Upon culmination of this activity, students should realize that words, once said, cannot be retrieved. Writing pieces will create a measurable assessment for grading. Classroom discussion will display an understanding of the behavior of kindness. Students should be able to demonstrate kind behavior and identify specific and concrete ways to display kindness. One Kathryn Otoshi Kathryn Otoshi RED likes to pick on BLUE. YELLOW, ORANGE, GREEN, and PURPLE don’t know what to do, but they know that RED isn’t being nice. ONE joins them when things get out of hand, and by example, shows the colors how to stand up for each other and for themselves. A Sack Full Of Feathers (Picture book) Debby Waldman Cindy Revell Yankel loves to tell stories, as long as they are someone else's. He does not see the hurt that his stories cause, the way they spread and change. Then the rabbi hands him a bag of feathers and tells him to place one on every doorstep in the village. Yankel is changed by what happens and finds himself with his best story yet, one of his very own. 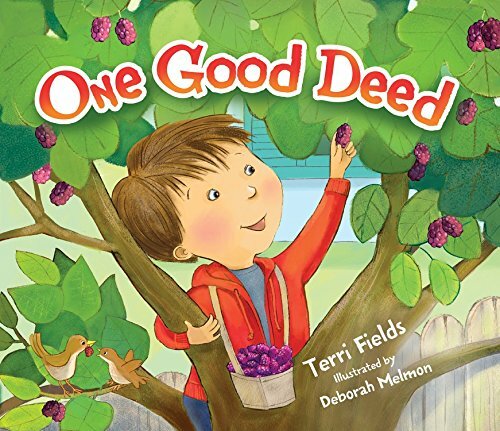 One Good Deed Terri Fields Deborah Melmon In this version of 'paying it forward,' one good deed leads to another as people in a multicultural neighborhood, including a Jewish family, change the life of the community. Those Shoes Maribeth Boelts Noah Z. Jones All Jeremy wants is a pair of those shoes, the ones everyone at school seems to be wearing. Though Jeremy’s grandma says they don’t have room for "want," just "need," when his old shoes fall apart at school, he is more determined than ever to have those shoes, even a thrift-shop pair that are much too small. But sore feet aren’t much fun, and Jeremy soon sees that the things he has — warm boots, a loving grandma, and the chance to help a friend — are worth more than the things he wants. 15: Can I Play Too?